This is a beautiful Monday in Buffalo because the Bills won. I did not watch the game of course. I was deep into this chapter of my book wherein our hero, Leonard Pennario, is struggling to re-kindle his career after the war took him to India for a year and a half. I was working on this chapter for four hours! But I knew in my heart the Bills had won. That is because you could hear it. I heard the car horns blasting the "Let's Go Buffalo!" rhythm. And people screaming. I think it was coming from Hertel Avenue. People watch the games out on the terraces and then they go flooding into the streets. It is like a scene from Barcelona or somewhere. I do not generally watch Bills games because I know zip about football. But I like the attendant drama. One thing I get a corrupt kick out of is the lawn job those kids did on that player's lawn! Leodis, his name is, something like that? I cannot memorize names like that. Leodis McKelvin? I think that is his name. It is like Lee Otis. That is how you can remember it. 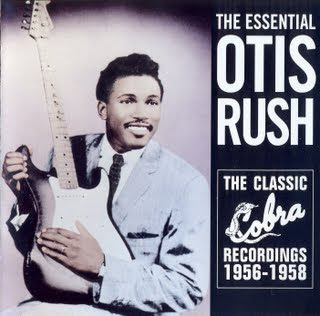 What about Otis Rush? He is one of my favorite bluesmen and that link is to a song I love although warning! I see it is very loud! Back to McKelvin. That is Lee Otis McKelvin at the top of this post posing in happier days with Ralph Wilson. 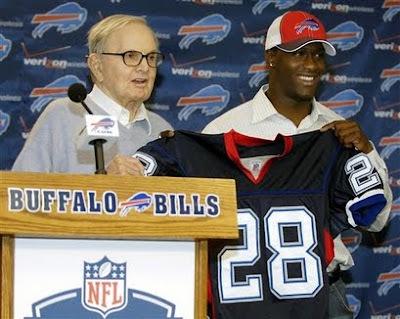 Note to out-of-towners: Ralph Wilson is the owner of the Buffalo Bills and the only person in our town who is addressed respectfully as "Mr."
Back to McKelvin's lawn. At first he was understood to say that he would not press charges. I even read that he said he was laughing about the lawn job. That made me love him! That made me think he was cool. But now apparently he is thinking about prosecuting. That is too bad. Well, maybe not. Here is what I think he should do. Check and see if the kids have any kind of criminal records. If they do, prosecute them. If they don't, don't. Reason being, we pay our football players big bucks to put up with stuff like this. Plus, let us not be naive. Who among us did not think, even for just a few minutes, of the people who, we would like to do a lawn job on their lawns? My list would be lengthy and it would be topped by former Miami Herald music critic James Roos. James Roos, nobody that he is, uttered this dumb thing about Pennario years ago. "Pennario was not a profound pianist," he said, "but..."
And this quote turns up everywhere! This dumb quote from this nobody! You have people like Fritz Reiner and Leopold Stokowski on record saying wonderful and intelligent things about Pennario but who gets quoted? Roos! He is even quoted in this gorgeous performance of "Le Tombeau de Couperin." They print only the part that followed the "but." But still. And get this. The quote appeared, "but" and all, prominently, in Pennario's obituary in the Los Angeles Times!! I could not believe that. Those days after Pennario's death were surreal for me to begin with. But then to open the paper and see that. What, were they trying to settle some old score? That was all I can think. Two words for James Roos: Lawn. Job. Inspired by the Leodis McKelvin situation, I went looking for him. But I found he died years ago. Alas. 'Alas', you say... this is time for a 'Zut Alors' cuz I had some paint and all kinds of good stuff with which to help you!